Chocolate…Do I have your attention? SPREADING some LOVE JUST IN TIME for Galentine’s and Valentine’s day. There’s a new edible beauty in town and it will help you achieve AGELESS skin! It’s called Ageless Delight! And I’m on my third piece.Not too sweet,tastes just right and you can’t even tell that it has all these beautiful ageless benefits for your skin. 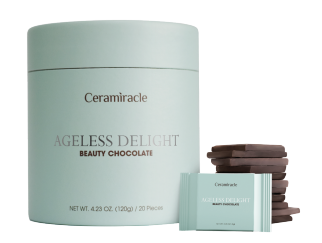 Ceramiracle has just introduced the first-ever, clean-label, sugar-free, AGELESS Beauty Chocolate Supplement — and it’s VEGAN, KETO, AND GLUTEN-FREE! Made with 70% organic South American Dark Chocolate. Fucoidan (RENEWS SKIN ELASTICITY): A super gut repairing antioxidant from seaweed that stimulates collagen production in your skin and protects your skin’s natural elasticity. Polyphenols (RICH IN ANTIOXIDANTS): Is naturally packed with antioxidants which aids in skin firming and rejuvenation. Phytoceramides (IMPROVES MOISTURE RETENTION): Helps to recreate the protective skin layer that has been lost to time by binding the skin together and locking in moisture. It improves the skin’s density and restores elasticity. I don’t know about you but I embrace age. It is a part of life. I don’t want to necessarily look younger and the word anti-aging is so over used. I want to look ageless and look my personal best. I also adore a good box of chocolates and these individually wrapped bites are simply DELIGHTFUL and taste heavenly! The company calls it soul food for the skin. The pretty aqua blue packaging reminds me of the spa and being by the sea. Can you feel it with me? If you want your skin to look flawless you gotta do this! DIRTY brushes = A dirty looking unpolished face. How-to Care for & Clean Makeup Brushes Oils from skin and dust adhere to brushes and can cause much dreaded breakouts. It is important to clean your brushes regularly. and wipe brush from side to side. As the towel gets dirty, dampen another section and repeat. Not only will this clean the brushes, but the Brush Cleaner evaporates quickly for a clean brush that’s ready to go! Shampoo & Conditioner: You can use a mild baby shampoo or an liquid soap. Rinse brush head gently under lukewarm water, with the brushes at a 45 degree angle pointing down, using fingers to massage Shampoo/Soap to hair. Apply in the direction of the hair from ferrule towards top. (Ferrule: The metal part of the brush between the hair and handle). Rinse gently under running water, thoroughly. If you’d like, follow as above with conditioner. Gently reshape the head of the brush and lay flat over the edge of a table or counter so that the bristles are open to the air on all sides. Allow to completely dry for a few hours and then simply hand fluff back to shape. ****Be careful not to let any cleaner or water run inside the ferrule (the metal part of the brush between the hair and handle). This can weaken the glue used to hold the hair and cause shedding problems or even loosen the handles. Always lay brushes flat to dry. 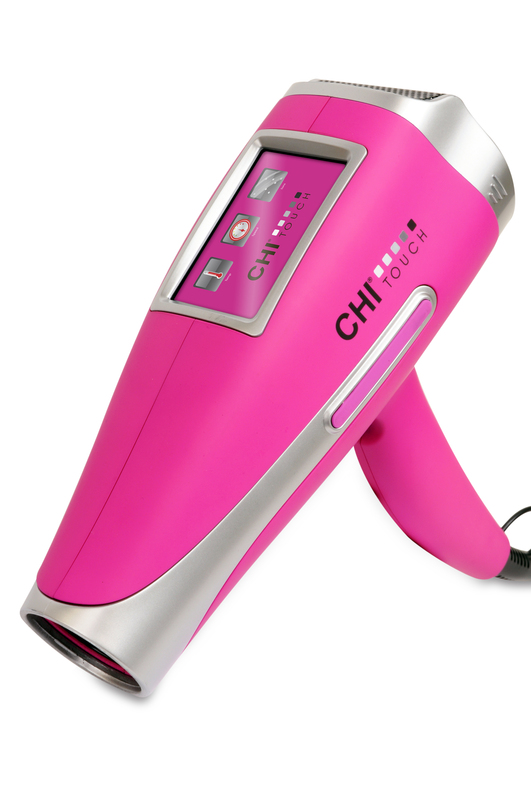 Do not use a blow dryer – this will cause the hair to frizz! With proper care, a quality (Not dollar store) brushes can be enjoyed for years. But remember that synthetic brushes don’t last as long as sable and other hairs. Got Zits? I get them too. Just found out about this product and wanted to share with you. 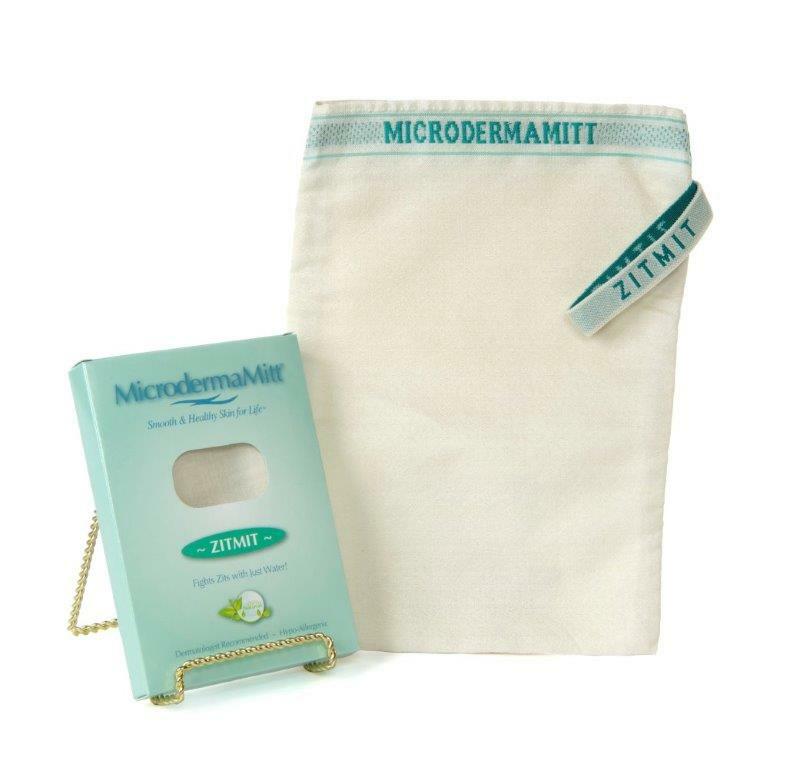 The ZitMit by Microdermamitt is designed to treat and help prevent acne and breakouts.It is a mit is a thin soft abrasive cloth you slip your hand into that cleans the skin gently and efficiently. The magical part is NO cleanser,no CHEMICALS,no zit cream or product at all. Simply dip into tap water use on a clean face on the area that has started to get a blemish or you may use on the entire face (not the eye area of course).It removes tired dull winter skin and will help your other beauty products penetrate and work better. Your makeup will glide on like butter on a slice of bread. This cleansing mitt increases cell turnover and calms down the irritated slightly blemished skin.And it does it naturally. I have very sensitive skin and really love mine!